What are those dark ones? In last week’s “Biology Challenge”, I challenged biology teachers to contribute identifications and descriptions of the relationships illustrated in a photo of aphids, ants and milkweeds. Sure enough, within an hour the milkweed was successfully identified as Asclepias syrica and the aphids as Aphis nerii. A number of various Formica species were sent in as tentative identification for the ants in the image. Though, I would not begin to suggest I know much about ants I am pretty sure you’ll find that these ants belong to the genus Crematogaster–the acrobat ants. Mark DuBois produced a Checklist of Kansas Ants in the Kansas School Naturalist that includes possible candidates. There are any number of resources on the web that might lead us to an identification if I collected some of the ants. But what I really want to get to is the nature of the interactions taking place on the tip of the milkweed leaf. Several people noted that the ants were tending the aphids in a classic ant/aphid mutualistic relationship. There’s several items that complicate this however and I think this image can serve as an open door to an incredible landscape of accessible student study. For starters, while ants do tend aphids on milkweed–the aphids tend to be Aphis asclepias and not A. nerii–that’s what caught my eye. Hmmmm…A. nerii presumably sports the bright yellows and oranges as warning coloration. If ants don’t typically tend A. nerii then perhaps the aphid’s “honeydew” is somehow not as toxic as normal in this instance. Milkweed plants vary in their toxicity–perhaps parts of the individual milkweed vary in toxicity as well. Check out Herbivory.com, Anurag Agrawal’s web site for a truly in depth introduction to the milkweed ecological community. In particular check out his powerpoints and videos under the Multimedia tab. These will introduce you to the incredible complexity of community level interactions that he and his colleagues are uncovering. Specifically link to his Publications tab–there, you’ll find a very rich resource of pdf’s that will help you to see the milkweed communities in a different light and help you to guide your students inquiry. I have spent hours reading these papers. I think you’ll find that many of them are very accessible. Here’s a Discover blog post that introduces one of the studies: Mooney, K. A. and A. A. Agrawal. Plant genotype shapes ant-aphid interactions: implications for community structure and indirect plant defense. American Naturalist 171: E195–E205. Here’s another relevant paper and a link to it: Smith, R.A., K.A. Mooney and A. A. Agrawal. Coexistence of three specialist aphids on the common milkweed Asclepias syriaca. Ecology 89: 2187–2196. Once a person starts to focus observations on a relationship like that illustrated in the photo from my original post, then all sorts of questions come to mind. I propose that this is one of our jobs as biology teachers–put students into a situation/an environment that promotes original and accessible student questions. Help them to focus their observations and reconcile them with what they know and don’t know. Questions will follow. What does this take in the classroom? Not much really, start a butterfly garden, participate in the Monarch Watch’s Waystation Program. Participate in Monarch Larval Monitoring project. 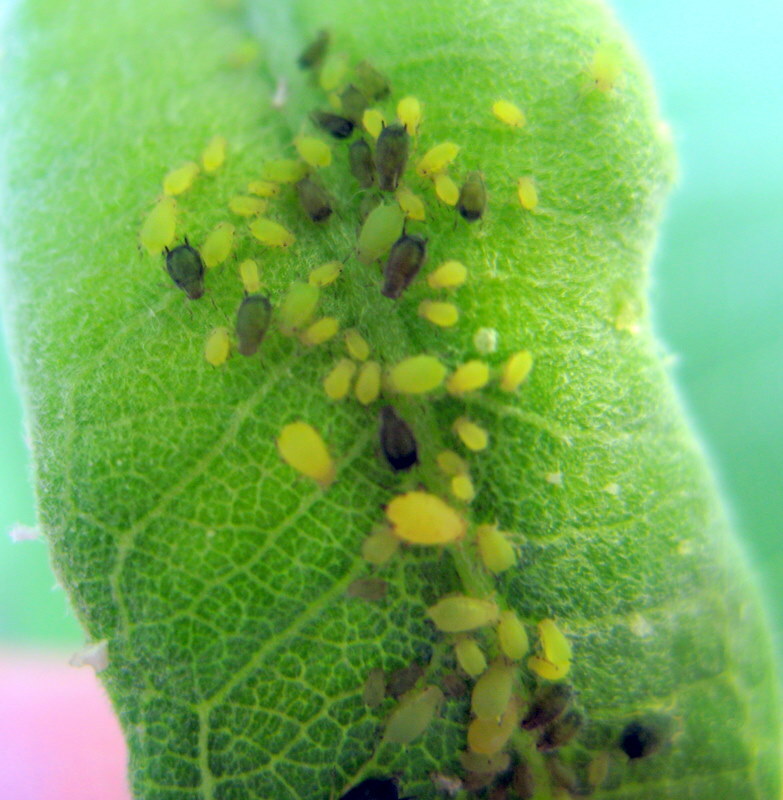 Here’s a resource on aphid from the MLMP: Monitoring Aphids. Participate in the earthworm project that Eric shared. Participation in projects like these almost invariably leads to students asking all kinds of questions. At first they are very general and non-focused but with only a little help with some guiding questions from their instructor the students natural curiosity can be turned to powerful questions for study. “The bee’s life is like a magic well: the more you draw from it, the more it fills with water”. Really, any natural system is like that once you start to pay attention to detail. Natural systems exude wonder and complexity that begs study. Exploit this with your students—introduce them to doing science by “drawing from the well”….